I have often been called a tightwad for choosing the lower priced option, but strangely enough, some of those same people will call me a spendthrift when I buy something that is pricier than average. What is up with that? First, I think there is a little of each in all of us. And you know what? We don’t see it that way, do we? We each have things that we consider worth spending more on and things we don’t find important enough for the added cost. The question is what and why? Computers are a big part of my life – I write, record & edit audio, video, photos etc. Nearly everything I do for my clients involves using a computer as an interface. For that reason, I will spend money on computer. No, I will not buy the highest end computer. I don’t need that much difference in performance. When computers first came out, I purchased higher end systems because the performance difference was much greater. Now, they are nearly identical commodities (for what I do) and thus purchase based on value. I have always said that I will gladly spend money for tools and experiences. By tools I do not mean a hammer and nails (unless I need one) but something that helps me accomplish something. By experiences, I am talking about things done with others (or solo) that I will look back on later and remember. I have found that tools and experiences are often intertwined. Bicycling has been important to me since 1983. In that time, my investment in bicycling equipment has been on the expensive end. My current mountain bike (Diamond Back DBR X2) cost me over $2,500 in 1999. This was at a time when a $50 bike was what the average person rode. But in that time, I have put over 5,000 miles on it and it still runs as smooth as ever. 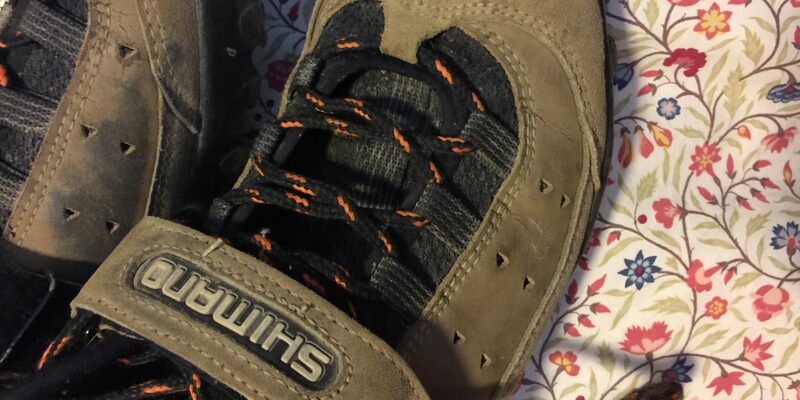 I bought Shimano offroad clip-in cycling shoes shortly before and they have over 8,000 miles on them. They too still fit, feel and function perfectly. These are a pair of shoes that cost around $100. Cycling gear makes or breaks the ride in my opinion. When I started racing and doing long tours, I began wearing cycling shorts. These rides would have been miserable without them and now I rarely get on a bike unless I am wearing some. I bought a pair of Bellweather cycling bib shorts (the kind that have shoulder straps and look kind of like a wrestling outfit) and they lasted me for 15 years! I can’t say that about any other item of clothing. Yes, I had other shorts too, but these were the ones I wore most often. The finally wore out and I dropped another $150 on a new set – ten bucks a year is cheap. I will spend money on trips. Don’t get me wrong there either – I will penny pinch to get the best price but I am always willing to spend on experiences like this. How do you pinch pennies and still get great experiences? You take the commodity parts (airfare etc.) and shop around for the best deal. You look at packages and discounts that may give you 80-90% of what you envisioned with 50% of the cost and then make a decision. My last trip, the airfare was covered by travel points, the car rental was negotiated down to $10 a day (unlimited mileage) and I still got to see/do all I planned with hardly any increase over day-to-day life. There are times when the accommodations IS the trip. When Dawn and I took an all-inclusive vacation to the Cancun/Cozumel area, it wasn’t about finding a cheap place to stay or saving on dining out. That WAS the experience. When we traveled to New York for a long Thanksgiving weekend a few years back, the travel and accommodations were not the point. The point was seeing New York. We averaged 30,000 steps a day seeing the sights in the Big Apple – not sitting in the hotel room. A 10 mile hike in the middle of a congested city’s greenbelt can transform you physically, mentally and spiritually. It is one of the great bargains in life. That is even if you drop some cash for great Oboz hiking shoes, Leki poles, Camelbak, hat, sunglasses etc. – the experience is well worth the investment. Yes, you can do it on the cheap too and still get a lot out of it, but I find it so much more meaningful and positive when done with quality gear.